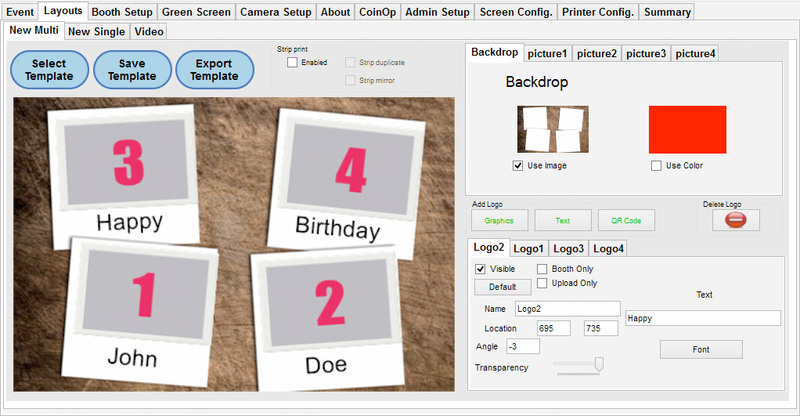 For a 4 Up image you can select and alter various aspects of how the picture will be presented. Clicking on the Individual pictures will allow you to drag and move the images around, or Clicking the Picture 1, 2 3 or 4 Tabs present you with the ability to type in the sizes instead. You can turn off the images as well, so you can have 1,2,3 or 4 images taken to suit. Below this you can add in Logo’s or Text via the Add Logo ‘Graphics’, ‘Text’, or ‘QR Code’ buttons, which then present you with the details to be altered below. Or again you can select these items in the preview and move them around and resize them. Alternatively if you have already saved some templates (some are already saved by default) you can click the Select Template and Choose on from the Thumbnails.